Crazy night out on the town and you see a traffic cone, what’s going to happen? Many people will take the cone and run with it on their head for a while, some may even decide it would be a great addition to their dorm room or apartment. But not so fast, stealing a traffic cone is actually grounds for a FELONY. How many cops are going to give you a felony for stealing a traffic cone? Most likely a very small majority, but just be smart out there. You give them too much of a hard time and you never know what could happen. This goes for all traffic safety supplies you see on the road like barricade lights and parade barricades. Think twice before you grab them! They can be called parade barricades, a-frame barricades type 1 or type 2 barricades or a bunch of other things. 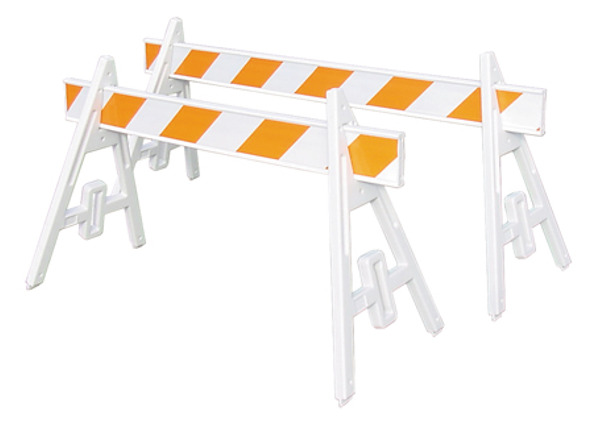 Basically these are barricades used for crowd control or to block off certain areas in a parking field, parking lot etc. Two legs with one or two boards ranging from 4′ long to 12′ long (or even longer if you have a custom built one). The legs and boards also have options. For example, if you want orange/white reflective sheeting, you can have it on one side, two sides and it can range from Engineer Grade to Diamond Grade. The boards can be either 1″ thick or 1.75″ thick and the legs can be sand fill-able to add extra weight for sturdiness. If you have any question about parade barricades please feel free to leave a comment below.